The 'free ion activitiy model' (FIAM) assumes that the uncomplexed free metal activity rather than total or dissolved concentrations reflects the portion of metal that is directly bioavailable and, thus, is responsible for possible biological effects. Predicting the uptake of metals from complex natural systems by the FIAM-model is based on the assumptions that mass transfer is not flux-determining, complex association and dissociation reactions are at equilibrium (meaning that bulk and surface activities for all metals are the same), and that the free ion activity controls reactions with surface sites on organisms and, thus, metal bioavailability. However, in natural systems the limiting flux of free ions is much larger than the real uptake into organisms. From recent studies it seems that bio-uptake itself may provoke dissociation of complexes and therefore increase the supply of free metals, which is finally defined by the rate of diffusion of free metal ions, or of different labile metal complexes. 'Surface complexation models' (SCMs) describe the adsorption of metals on pure minerals, soils or sediments. In these models it is assumed, e.g. that (1) mineral surfaces are composed of specific functional groups reacting with dissolved metals to form surface species, and that (2) the electrical charge at the surface is determined by the chemical reaction of the particular mineral functional groups. There are various methods available today to assess the surface site density of single minerals. Howevere, for complex mineral assemblages, the so-called "reactive" specific surface area is measured. From this, one can quantify the concentration of functional groups that participate in surface complexation equilibria, by measuring site densities (per unit surface area) of single minerals. Recent research suggests that most adsorption data can be modelled by assuming two non-equivalent surface binding sites, i. e. a "strong" and a "weak" site (two-site models). As a whole, all these experimental and modelling techniques are still not so far developed to reliably quantify the relative abundances of various surface functional groups in complex mineral systems, or to identify surface functional groups that dominate adsorptive interactions. It has always been a challenge for environmental scientists, like chemists or biologists, to assess the behaviour of trace metals in natural systems solely based on either purely physicochemical or biological characteristics. For this reason, there are increasing attempts underway now to bridge both aspects by combining biological and chemical standardized methods and by integrated modelling of both types of data (see in particular the following chapter 6). How complex the relationship between metal speciation and bioavailability can be, was recently shown by Eimers et al. (2002). Stable Cd isotope ratios in sediment and water were measured and compared to the ratios measured in asselids to examine whether Cd partitioning could predict metal bioaccumulation. Alhtough it was shown that Cd concentrations in the overlying water determined accumulation in Assellus, it was also uncovered that increasing sediment organic matter decreases the concentration of Cd in the overlying water and so bioaccumulation of this metal. In particular the comparative importance of geochemical, metal-specific and organisms-specific influences on metal bioavailability has not been quantitatively considered yet. Aquatic sediments constitute an important food source for many deposit- and suspension feeding animals. To assess the potential impact of sediment contamination to aquatic ecosystems, we have to assess the degree to which sediment-bound metals are assimilated into animal tissues and the mechanisms controlling their bioavailability. As seen before, caution should be employed in comparing experimental results derived from distinct single-components in the laboratory, to data obtained from the field. Generalizations are possible within some types of ecosystems, but difficult to develop across metals or ecosystems. So far, bioavailability studies directly related to geochemical species are still rare. Despite an obvious need, surprisingly little research has been devoted during the last years to attempts to link the concept of bioavailability of metals (their uptake, assimilation and accumulation in organisms) to their chemical speciation. In the following, we will present some examples to illustrate some of the most recently developed concepts to measure, describe and explain the interaction between metal speciation and bioavailability. Concerning a quantitative determination of the portion of metals, which is really bioavailable, the 'free ion activitiy model' (FIAM) seems to point into the right direction, as supposed by many scientists today. It assumes that the uncomplexed free metal activity rather than total or dissolved concentrations is decisive for possible biological effects in organisms exposed to metal-contaminated sediments. According to Vink (2002), however, evidence for the success of FIAM is still rather limited and its full applicability to natural waters remains still to be demonstrated, in particular due to the presence of natural dissolved organic matter (DOM). For this reason, future progress is expected from methods able to measure free metal ion activities also in the presence of naturally occuring organic ligands. We know that DOM decreases metal toxicity due to decreasing the free ion activity, although total dissolved metal fractions may increase.We also know that the free Me2+ activity increases in response to total metal content and increased solution acidity, which supports the the assumption that the free metal activity is controlled by complexation-adsorption rather than mineral solubility equilibria. Metal ion activity calculations based on chemical equilibrium reactions also seem limited due to the lack of kinetic considerations. In-situ techniques like ion-selective electrodes, or DGT (see section 5.5.3), dialysis or millipeeper methods (for porewater recovery), may overestimate ion activities as they also respond to and interfer with other elements (like sulphides, metals, DOM), or they are not able to monitor concentration shifts during organisms exposure. In a more theoretical contribution, Leeuwen (1999) states that predicting biouptake of metals from complex systems by the 'free ion activity model' is limited to conditions where mass transfer is not flux-determining. One major assumption of FIAM is namely that transport of a metal in solution is fast compared to metal uptake, so that the latter can be considered as the rate-determining step. Also complex association and dissociation reactions are supposed to be at equilibrium, meaning that bulk and surface activities for all metals are the same. For this reason it is supposed that the free ion activity controls reactions with surface sites on the organisms and consequently governs bioavailability. For complex natural systems the limiting flux of free ions should be much larger than the real uptake flux to organisms. Here, one may ask whether an organism will be satiesfied with the very small metal flux or if biouptake itself will provoke the dissociation of complexes and so increase the supply of free metals. For a wide range of concentrations, the relation between biouptake and bulk concentrations has proved to be non-linear, whereas for the transport rate it is. There are systems where mass transport may not be negligible with respect to biouptake, e. g. where complex dissociating conditions contribute to the transfer of metals to the phytoplankton cell surface suggesting radial diffusion and complexes with diffusion coefficients equal to those of free metals. 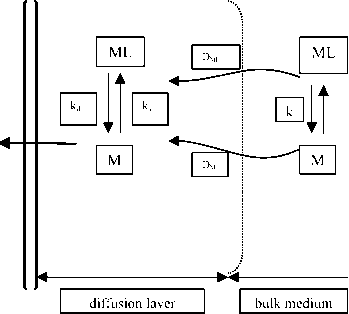 The overall scheme of the processes of biouptake of the free metal ion (M) according to Leuuwen (1999) is depicted in Figure 5.1, including the diffusional transport of M with the diffusion coefficient DM, the interconversion between M and ML (complexed metal ion) governed by the rate constants ka and kd, and the possibly resulting coupled diffusion of ML (with diffusion coefficient DML). Since many environmentally relevant complexes diffuse much slower than M, the distinction between DM and DML is important. The actual biouptake follows a Langmuirian-type adsorption of M at the outer cell wall and a subsequent first-order rate-limiting internalization step. The supply of free metal ions (M) is finally governed by the diffusion of free metal or complexed diffusion of the different labile metal species (ML). 'Surface complexation models' (SCMs) are increasingly used today to describe the adsorption of metals on pure minerals, and partly on natural aquatic sediments. Three main types of SCMs have been developed, i. e. the 'capacitance model' (CCM), the 'diffuse layer model' (DLM), and the 'triple layer model' (TLM). Most work on SC has been done on the adsorption of ions by a variety of discrete mineral surfaces. Applying it to the adsorption of ions on soils and sediments is still rather rare due to the complexity of these natural systems. For example, the adsorption experiments by Davis et al. (1998) with Zn2+ showed a comparably smaller pH range of the "adsorption edge " on quartz powder than on natural sediments, probably due to the greater heterogeneity of surface functional groups existing on complex mineral surfaces in soils and sediments (including for example organo- and phosphato ligands). Davis et al. (1998) also point out to the fact that the surface properties of minerals in soil and subsurface environments are much altered by accumulating poorly crystalline Fe and Al oxyhydroxides and silicates. Subsequent early diagenesis together with bacterial interactions may leach these surface layers and consequently form so-called mixed-layer clays and/or cause the deposition of extremely fine-grained high-surface area precipitates. These processes will handicap a proper use of the SC modelling, as some assumptions in the development of SCMs for pure single minerals may not be valid any more for complex mineral assemblages (like soils or sediments). In many if not most cases, surface properties of sediments are determined by secondary minerals or grain coatings although constituting a minor amount/fraction of the total sediment mass. As an example, the authors refer to a study (ref. given), in which surfaces of silica, rutile, ferrihydrite and goethite became enriched with Al when mixed with poorly crystalline alumina or with a dissolved Al-containing solution, resulting in a kind of surface enrichment, which can completely alter the surface properties of minerals. The authors also resume that the formation of Al- and Fe-rich surface coatings observed in their experiment, was the cause why quartz powder surfaces proved to be less reactive than natural sediment surfaces. A variety of methods is now available to assess the surface site density of single minerals, but experimental interferences still hamper their use for natural solids. To determine surface site densities for SC modelling of complex mineral assemblages, Davis et al. (1998) suppose to measure the "reactive" specific surface area (e. g. by the 'BET' method; ref. given). Once the specific surface area is known, one can quantify the concentration of functional groups that participate in SC equilibria from measuring site densities (per unit surface area) of single minerals, which in turn are available for many discrete mineral phases from the relevant literature. There are two modelling approaches supposed to provide first predictions of the adsorption of trace metals by natural sediments. For the 'component additivity' (CA) approach, the surface area of each mineral present at the surface is multiplied by the site density established for that mineral. For the 'generalized composite' (GC) approach, the recommended value for site density is 3.84 ^mol of surface sites per m2 of surface area, which is consistent with the value recommended for ferrihydrite given in the literature (ref. given by Davis et al., 1998). In fact, correcting for these electrostatic effects, calculation with the DDL model suggests that 1.7-2.0 protons are released per Zn2+ adsorbed on ferrihydrite depending on pH and ionic strength. In contrast to this, the 'non-electrostatic model' (NEM) is more straightforward and assumes surface equilibria strictly as purely chemical reactions without correcting for electrostatic effects. The pH-dependent Coulombic energy is simply included into the resulting binding constant. As one consequence, derived mass action equations that describe ion adsorption do not provide an accurate stoichiometry of the involved reactions at the molecular scale. But since it is difficult to assess the actual surface site density of complex mineral mixtures (like soils or sediments), it is usually not possible to realize a proper electrostatic correction necessary for developing more complex SC models, like DDL or TLM (triple-layer model). In this context, Davis et al. (1998) also point to the fact that the surface charge of minerals in natural waters is different from simple electrolyte solutions. As an example, the formation of organic coatings and the adsorption of major ions (like Ca2+, Mg2+, SO42-, silicate) change the point-of-zero-charge (pHPZC) and isoelectric point (pHIEP) of minerals. In addition, their obtained experimental data proved that the pH dependence of Zn2+ adsorption on natural sediments is less steep than on hydrous oxides (as expected). The data suggest that Zn2+ adsorption on natural sediments fits best with eq. 10, while adsorption by quartz fits best with eq. 11. Also, pH dependence of Zn2+ adsorption was well described with only one surface reaction. From this, it may be concluded that most adsorption data can be usually modelled by assuming two non-equivalent surface sites, i. e. a "strong" and "weak" binding site. However, according to the 'NEM' model, the average 'free energy' of the complexation of Zn2+ with surface sites on a natural sediment is characterised by assuming that all surface sites are chemically equivalent (one-site model). Experimental techniques to quantify the relative abundances of various surface functional groups in complex mineral systems, or to identify surface functional groups that dominate adsorptive interactions, are still not well developed. The authors refer to recent studies, where 'SIMS' and 'Auger spectroscopy', and aqueous extractions revealed that sediment grains are covered with Fe-, Al- and partly Mn-rich coatings probably derived from the weathering of feldspars and Fe-bearing minerals. Preliminary calculations done for goethite suggest that surface hydroxyls were not present in sufficient abundance to solely explain the adsoprtion of Zn2+ by the sediment. In the authors' opinion, the 'GC' approach seems therefor more preferable to other empirical approaches, like establishing distribution coefficients (kd) or adsorption isotherms. The work of Davis et al. (1998) indicate that both SC modelling approaches presented here (i. e. CA and GC) can be successfully applied to model adsorption of metal ions by soils and sediments. But the authors claim, future research should focus more on a better characterization of the composition of sediment surface coatings at molecular levels as well as on the utility of specialized aqueous extractions as a means to quantify surface functional groups. In this context, future research should also address the questions of how dissolved or adsorbed ligands control the bioavailability of metals to organisms (see chapter 6), and how to reliably quantify the thermodynamic characteristics of adsorbed and porewater metal binding ligands. Mouvet and Bourg (1983) (cited in Wen et al. 1998) were the first, who reported that adsorption constants of metals are directly proportional to their first hydrolysis constants. 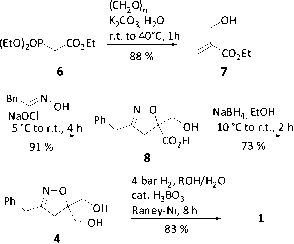 Based on acid-base titrations and adsorption experiments, Fu and Allen (1992) (also cited in Wen et al. 1998) subsequently showed that the adsorption behaviour of natural sediments can be modelled via one or two surface reactions. Soon, the concepts of triple layer, diffuse layer and constant capacitance SCM were introduced to study metal adsorption on oxic sediment and soil (further references are given in Wen et al., 1998). According to Wen et al. (1998), SCMs can be applied in two different ways to composite materials, like natural sediments. At first, sediments can be treated as an integrated whole with adsorption of metals described as complexation with average surface functional groups. The second way considers only main composites that are supposed to dominate adsorption interactions. Accordingly, the 'capacitance model' assigns only one plane in the interface and all specific adsorbed ions are assigned into that surface plane. The electrical double layers are of a Helmholtz-type (detailed references are given), with three specific parameters, including an electric capacity (C), and two intrinsic acidity constants (pKa1int and pKa2int). The diffuse layer model assigns two planes in the interface: a surface plane for adsorption of H+-ions, OH- and all specifically adsorbed species (including metal ions), and a diffuse layer plane described by the Poisson-Boltzmann equation (see ref.). On the other hand, there are three planes in the interfacial region of the triple layer model: again a surface plane for adsorption of H+, OH- and strongly adsorbed ions, a near-surface plane for weakly adsorbed ions, and a diffuse layer plane representing the closest distance of approach of dissociated charges. Wen et al. finally conclude that the model calculation as well as own experimental adsorption data so far indicate that metal adsorption, e. g. on river sediments, is strongly pH-dependent. A large percentage of adsorption occurs within a narrow pH range, the classical so-called "adsorption edge". By increasing total dissolved metal concentration, the pH adsorption edge is consequently shifting to higher pH values, indicating a decrease of the adsorption affinity (see also section 5.5.4).